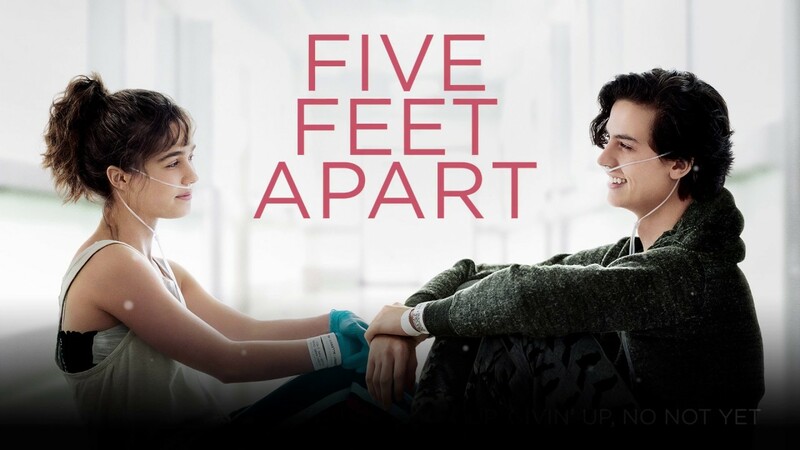 Justin Baldoni’s Five Feet Apart, the recent adaption of the YA novel of the same name by Rachael Lippincott, is definitely a movie that intends to hit you in the feels. Following the story of Stella, played by Haley Lu Richardson, a young girl diagnosed with Cystic Fibrosis and hospital-bound for extended lengths of time, the film shows what it’s like to navigate the life of a youth living with a terminal illness. During her hospital stay, she meets the cynical and sarcastic Will, a fellow ‘CF-er,’ portrayed by Cole Sprouse. During their shared time in the hospital, the two develop a romantic relationship. This relationship is tested however as the number one rule for patients at the hospital diagnosed with CF is that they must remain at least six feet apart at all times. I think one of the strengths of the film is that it wasn’t afraid to show the rawness that exists with CF, and instead of being a typical teen love story, the CF storyline was at the foreground as well as the blossoming relationship between both Stella and Will. To add depth to the characters, the audience gets to follow along with the painful, intense, and brutal regimen that many patients with CF follow on a day-to-day basis, giving an inside look at how the disease affects those diagnosed. To those that were critical before the film’s release because of how much it seemed like an echo of Josh Boone’s 2014 teen drama “The Fault in Our Stars” (also a YA adaption,) there is a fair statement to be made that this movie, while similar, can definitely stand on it’s on. The supporting cast was absolutely fantastic, with exceptional performances from Moises Arias (not the first time he’s played a character with CF, as he also did in Jordan Vogt-Robert’s indie hit “The Kings of Summer,”) and Kimberly Hebert Gregory. Arias and Gregory bring a touch of some much needed comedic relief to the story-line, as Arias plays best friend and fellow ‘CF-er’ to Stella and Gregory plays the nurse in charge of all three adolescents. An undertone of rebellion exists within the plot as all three patients are constantly trying to not get caught by Nurse Barb as they break the rules in an attempt to be the ones in charge of their lives instead of their life-consuming illness. This point is greatly dictated when Stella and Will decide to “steal” an extra foot between them, hence the given title. I have not read the novel, so I can’t attest to the accuracy of how it is followed – however, I can say that film did stand to impress me. I found it admirable that this wasn’t just a typical teen romance movie, but was able to maintain great character development, solid acting from its performers, and a storyline that goes a little off the beaten path (even though it might be dark and depressing.) While I don’t see the film getting any critical acclamation, it was enjoyable, relatable, and refreshing to see a plot unfold and educate its audience about a serious medical issue that doesn’t receive as much recognition or acknowledgment, and yet remains to be a serious issue affecting many young individuals.